I came across the coolest shelf a couple weeks ago. I spied it on Anthropologie and I was TOTALLY inspired for this month’s Power Tool Challenge. This month we’re all about Spring and this cute Wooden Swing Shelf just screams SPRING to me. 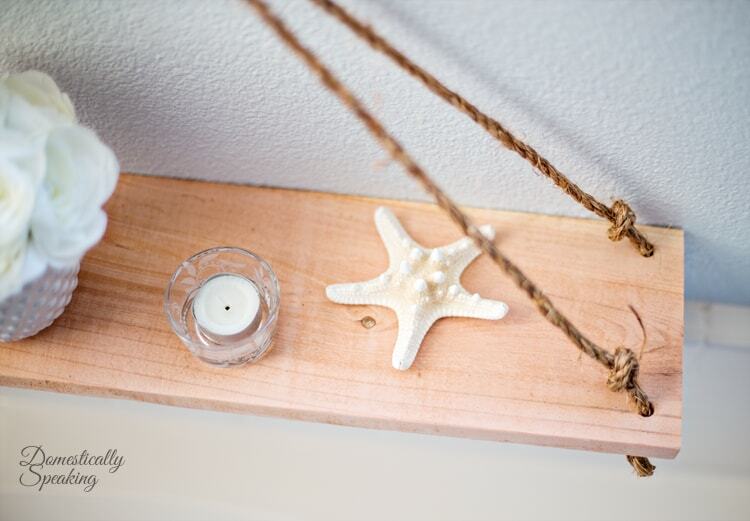 I added a nautical vibe because I love all things beachy. 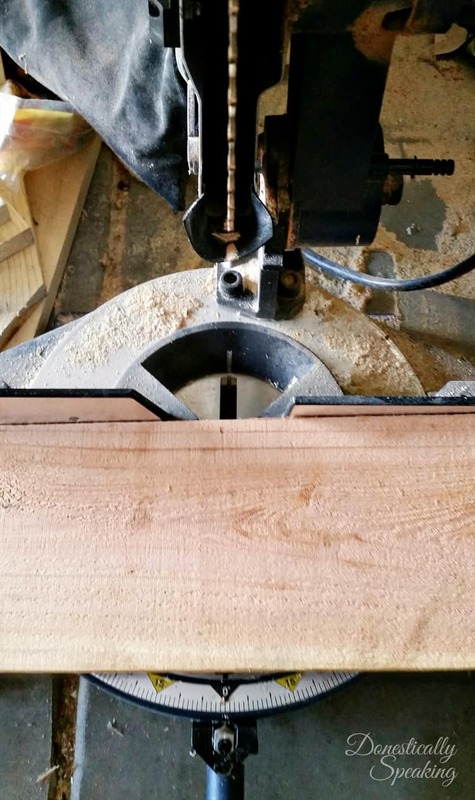 So let me show you how I made this swing shelf. 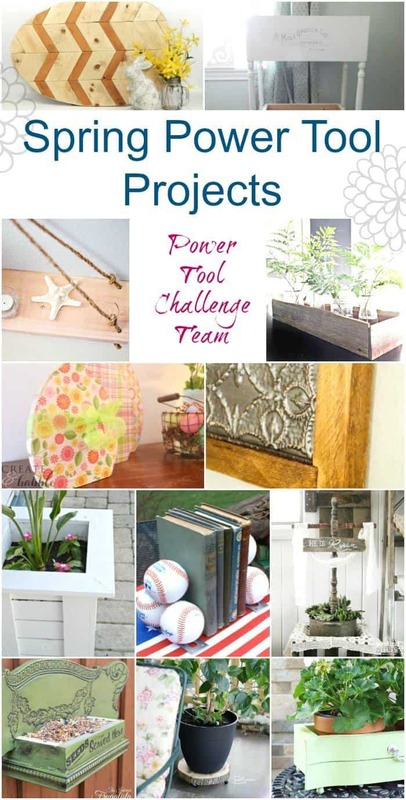 Plus make sure to check out the other awesome Power Tool projects featured below. If you follow me on Instagram I gave you guys a peek at this shelf that I LOVE! I wanted my shelf to be 2 feet long. So I used my miter saw and cut down the board. Then I used my drill and a drill bit just a little bigger than the diameter of the rope (so you can slide the rope through the hole) and drilled a hole in each corner. I just eye balled… but I went in about 1″ on each side. Then I used my sander and gave it a good sanding so it was smooth to the touch. 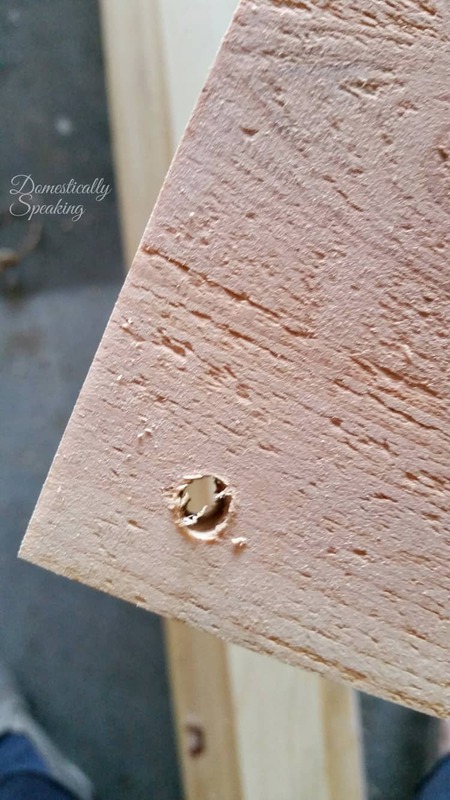 Make sure that you go around those holes you just drilled to smooth off those drilled edges. Now it’s time to get your rope. I started on one side and tied a knot on the bottom of the board. You just need 1 knot, but pull it tight. 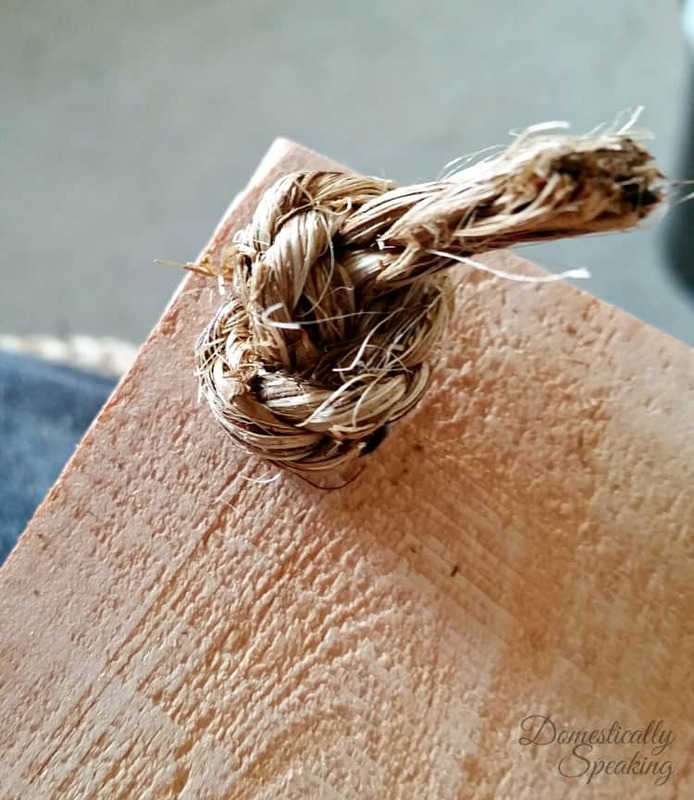 Now turn the board over and you want to tie another knot on the other side of this hole. You want to leave about an inch between the board and the knot. Now take the end of that rope to the other side’s hole. You want to tie the knot on top first on this side. You’ll want to play around and see how low you want the shelf to hang to decide where you want to tie that knot. I left the knots on the 2nd side a little loose until I was sure on the length. I took the shelf to the bathroom and made sure it was just right before I made it snug. 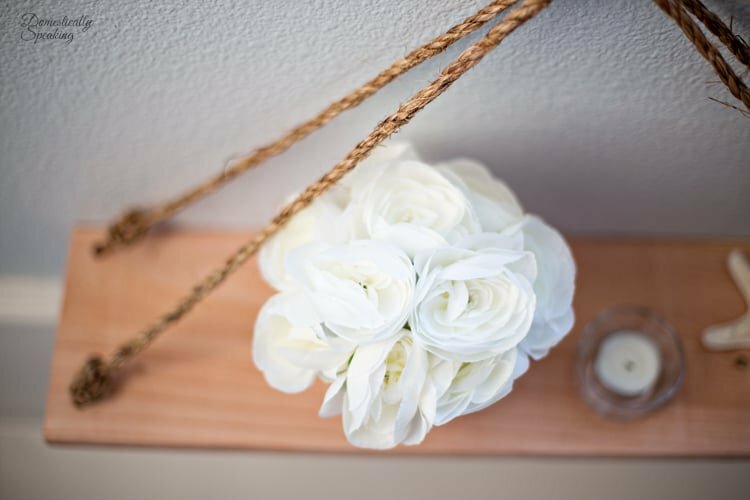 Now put the end of the rope through the hole and tie it off… making sure you’re leaving enough slack on the top so you have that inch gap between the cedar shelf and the hole. Now repeat on the next side. I did the back rope 1st, so this second rope (front rope) is going to be slightly longer because the rope needs to stretch back at the top to hang on the nail. So when you get to the second side make sure you try hanging it on the wall and that the shelf is sitting flat before you make it really tight. I had to play with mine a little to get it just right. Seriously friends this is a 20 minute from start to finish project!!! 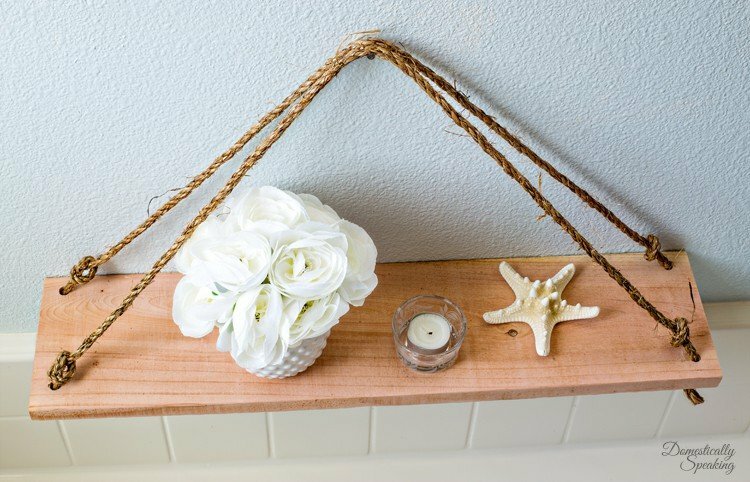 Of course you can pick any wood you want… stain it, paint it, use different colored ropes… so many possibilities! I hung mine on the side of my bathtub. I add some flowers, a votive and a starfish. 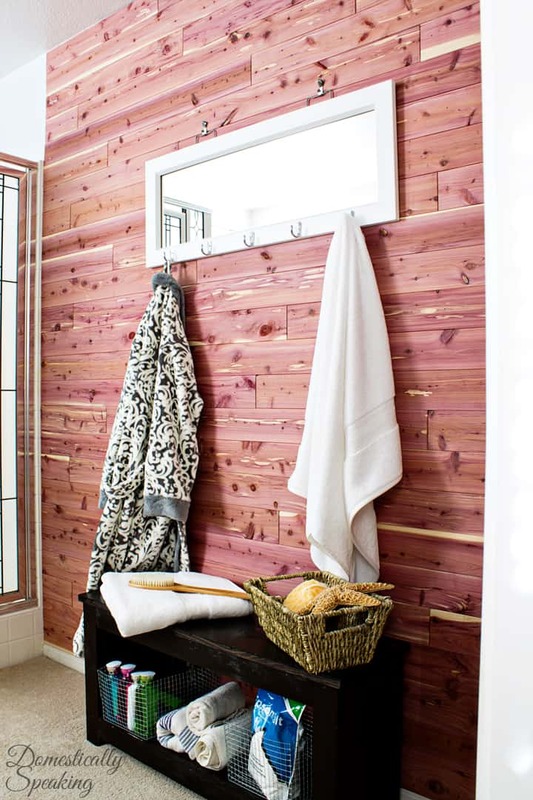 The cedar shelf goes perfectly with our cedar plank wall we installed last year. It definitely added to the spa feel I’m going for in here. Now make sure to check out all these other awesome ladies and what they’ve done with Power Tools! I love that shelf! I have some wood I was thinking about making shelves from, one will definitely be a swing shelf. I recently found your blog and love it! I am making my way through it. ? SO cool! Love this!!! Awesome job! 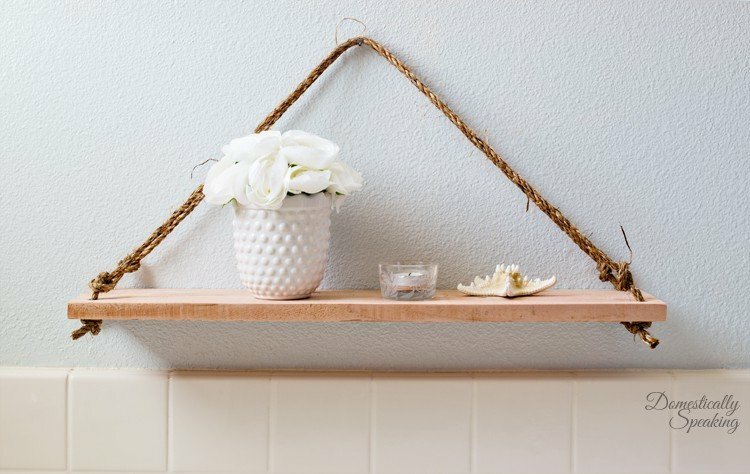 What a simple and adorable idea for a shelf. I wouldn’t have ever thought to use a rope to hang it with. Not sure what we ever did without the internet and sharing such great ideas lol. Thanks for linking up with Inspire Me Monday. Sharing with my followers! I hope you have a blessed Easter!! What a sweet and simple shelf! Love it! You guys did a great job on your challenge. Thanks for linking up to Merry Monday! Sharing on G+! Have a great week! You just inspired me to make one of these, I love it! This shelf is perfection! Rustic and chic! Thanks for linking up to the party this week! That came out so well. And it is the perfect little shelf for a small space. I love it! Love it! I really need to make one of these! This is super! I wouldn’t have thought to hang a wood shelf on the wall like that. 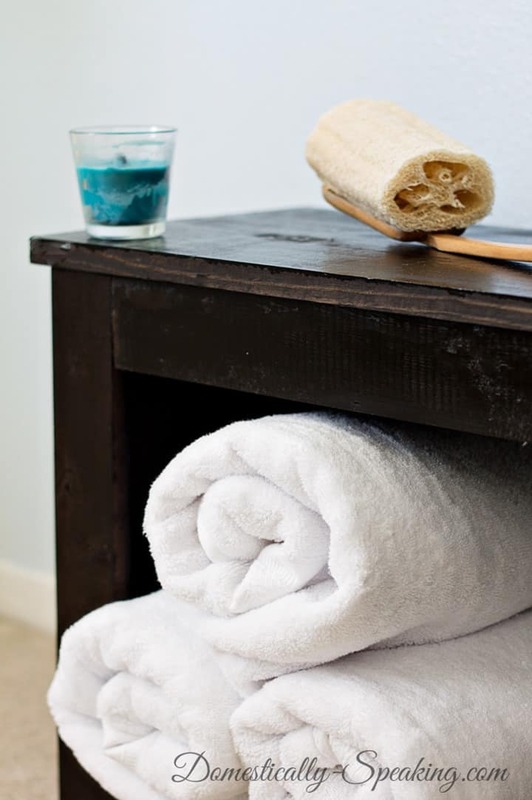 Seriously loving this idea – One of these will fit perfectly in my bathroom too! Fabulous project! 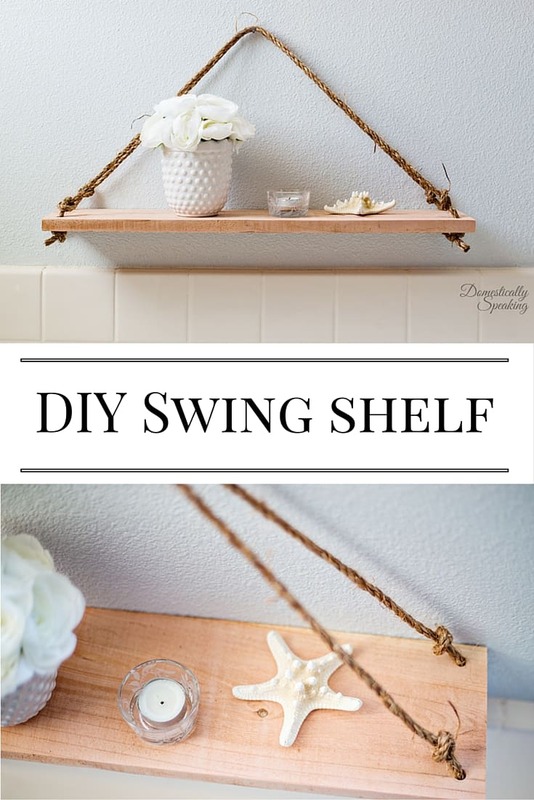 I love your simple wooden swing shelf! . I love the look of the raw wood with the rope. Thank you Gail… me too! I can think of so many places that this shelf could be used. I love that it can be made in a very short amount of time. Yep – gotta love fast DIYs! So simple, yet so effective. I love it!